Something new for us as we've never grown roses before. I chose five, one of which is a climber. They don't look much at the moment but nevertheless I'm quite excited. I look forward to posting photos of the flowers. 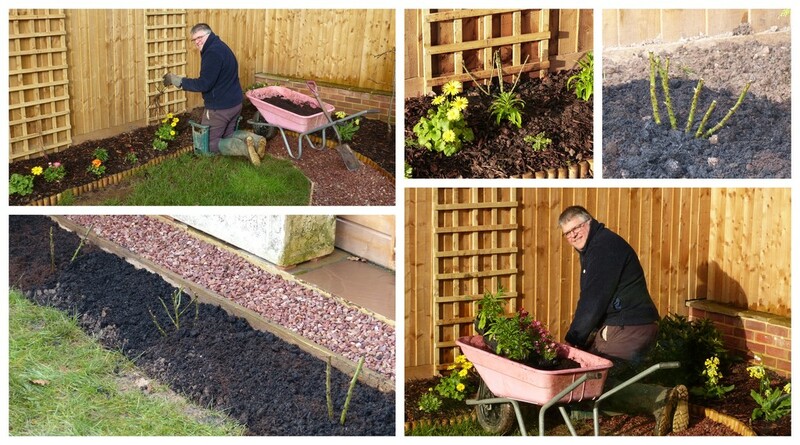 A lovely collage of your man at work and your well cared for garden - Looking forward to see these roses in bloom ! Does he want to come and work on our garden? Your garden is going to be so beautiful. We are in the middle of planting a virtually new garden having had a bit of landscaping done. Such fun starting from scratch! How lovely roses will look in your garden. You choose the subjects and he does all the work - that's not equal sharing, I would say, haha. I love roses and I never cut the flowers, I like to enjoy them on the bush.